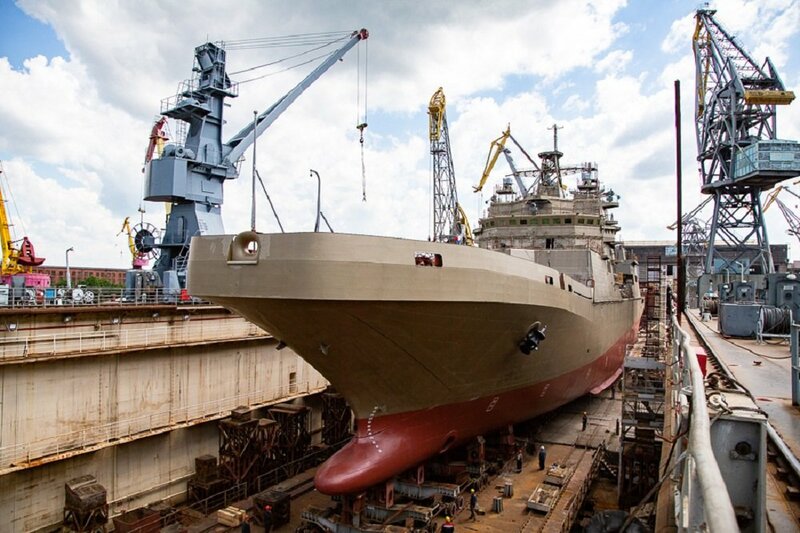 KALININGRAD, the Russian Federation, (BulgarianMilitary.com) – Today, the General Director of the Kaliningrad-based shipbuilding company, Yantar Shipyard, announced that the Russian Navy’s Project 11711 second landing ship Pyotr Morgunov, will enter trials no later than March 2019, learned BulgarianMilitary.com. In September 2014, the Russian Defence Ministry concluded the contract on the construction of the large-size amphibious assault ship and in June 2015 it was laid down. The Pyotr Morgunov, which is the first serial-produced Project 11711 warship designed by the Russia’s oldest surface ship design organization – Nevskoye Design Bureau, was floated out on May 25 this year at the Yantar Shipyard on the Baltic coast. It is scheduled to be accepted in service with the Russian Navy after all of its trials are over. The largest warship, of its class Pyotr Morgunov can displace 5,000 tonnes, being able to take on its board 13 main battle tanks, or 36 armored personnel carriers or infantry fighting vehicles, with an option to take a marine infantry battalion, as well. It also features the capability to land and transport a reinforced marine infantry company with organic military hardware. The Pyotr Morgunov is armed with 30mm six-barrel artillery guns and two Kamov Ka-29 assault transport helicopters in its deck hangars. The lead landing ship of the Project 11711 – Ivan Gren was floated in May 2012, in Kaliningrad and has been accepted for service in the Russian Navy on June 20, 2018. Then in late October, it has arrived at the main naval base of the Northern Fleet – Severomorsk.